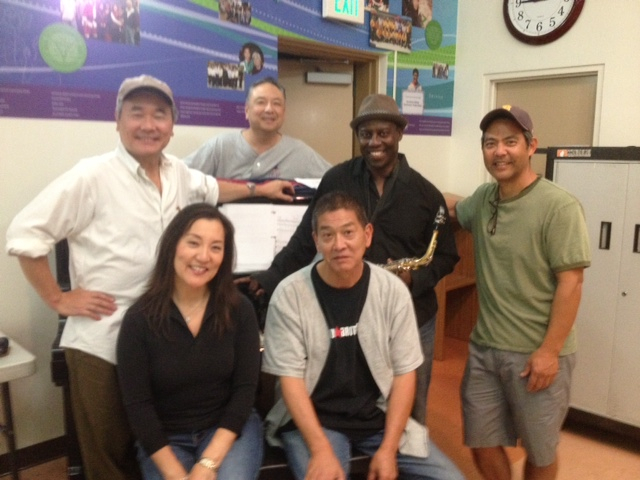 Standing, from left: Director Darrell Kunitomi, playwright Soji Kashiwagi, cast members Leslie A. Jones, Kurt Kuniyoshi. Seated: Cast member Keiko Kawashima, musical director Scott Nagatani. During World War II when the United States government forcibly removed Japanese Americans from the West Coast into concentration camps, Little Tokyo in Los Angeles turned “bronze” — that is, it became Bronzeville, a short-lived African American enclave that replaced Little Tokyo. This intersecting history between Bronzeville and Little Tokyo will be explored in a musical encore performance of “The J-Town Jazz Club” by the Grateful Crane Ensemble. Grateful Crane introduced the public to the history of Bronzeville at their first show in 2011 in Torrance. Since then, playwright Soji Kashiwagi has revised the script. The premise of the script, however, remains the same. The musical begins at the end of World War II when a group of Japanese Americans return to Los Angeles from camp, only to find that their pre-war Little Tokyo community has been transformed into Bronzeville during their absence. From there, the cast takes the audience on a musical excursion through Bronzeville and Little Tokyo. The new tour, however, will be a bit edgier with explorations into darker themes such as the conflict that arose during the transition from Bronzeville back to Little Tokyo, and the repressed trauma that the camps wrought upon the Nikkei community. As such, the music of the show will be more bluesy, rather than straight 1940s swing, and it is no accident that the Japanese Americans in the show will be returning from the Tule Lake Segregation Center, the camp most stigmatized by Japanese America. Overseeing the group will be a spirit presence that makes herself known throughout the show. Kashiwagi said as he delved deeper into Bronzeville history, he realized the shared oppression that African Americans and Japanese Americans experienced during World War II. Tying the show together will be the concept of family and the ties that bind us, whether biological or organizational. Kashiwagi hopes attendees will come away with a new understanding of that transition period. “It’s a little-known part of history,” said Kashiwagi. “But this is not just Japanese American history. It’s African American history. It’s Los Angeles city history. Interest in the history of Bronzeville appears to be increasing. Earlier this year, LA ArtCore, The Robey Theatre Company and Kathie Foley-Meyer presented “Project Bronzeville,” which included an art exhibit at LA Artcore; an encore production of “Bronzeville,” a play written by Tim Toyama and Aaron Woolfolk; a night of live music at the Blue Whale jazz club; and a panel discussion on the Bronzeville period with Christoper Jimenez y West, Ph.D., Hillary Jenks, Ph.D., and Anthony Macias, Ph.D.
Jenks also wrote an article on Bronzeville for the Southern California Quarterly, while The Downtown News published a Bronzeville article by Kirk Silsbee. The Grateful Crane Ensemble’s “The J-Town Jazz Club” will be performed on Saturday, Oct. 26, at 2 p.m. at Nishi Hongwanji Los Angeles Betsuin Kaikan, 815 E. First St. Tickets are $25 for general admission. For more information and reservations, call (310) 995-5841.